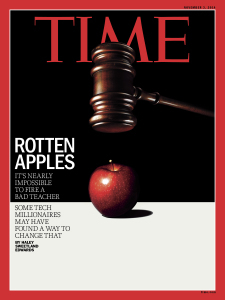 TIME Magazine is the latest media outlet to vilify teachers. The Nov. 3rd edition conveniently snipes at teacher tenure, while giving corporations the nod. How much money did they get, you have to wonder, to show the gavel hitting the apple? And gavels should be what they fear. A lot of places are starting to wise up to the fact that it will take some court action to put education and teaching back on track. Letting corporations take over America’s public schools isn’t going to be a cake walk. Maybe they’ve figured that out. The larger question, I wondered, is why do people hate teachers? Well, I began reviewing the literature, and, based on what I read, and, what I know personally, I have decided that people really don’t hate teachers. They may have had a teacher, or a couple of them, that weren’t very good or who really were unkind, and they don’t like those teachers. But most people don’t condemn a whole profession just based on one teacher, like you don’t usually blame the whole medical community when a doctor fails to cure you or your loved one. In fact, I know many parents who adore teachers! They support them every day! In general, teachers used to be well-respected. High school students often considered teaching a reputable career. The venomous propaganda against teachers began 30 years ago when a group of business elites and politicians decided to privatize public schools. Up until then, teachers had a difficult time of it, but they were still pretty much esteemed. Then, those in power, bought into the corporate message and the Milton Friedman belief that privatized was better. The hatred for teachers today is the result of years of overall maligning by media sources. For example, for years the Phi Delta Kappan Gallup Poll indicated that Americans liked their own public schools, but they didn’t think public schools in general were very good. Why would people think that way? They believed what they heard and read. They bought into the propaganda! Teachers were also blamed for students not doing well, which was never the case. Students throughout the years have made steady progress, although schools are so obsessed now with unproven standards and testing that there is a real threat to future student achievement. The teachers’ unions, both the AFT and the NEA, in trying to show good faith, have attempted to do what corporations want them to do, to build so-called partnerships, so the public will see them as cooperative. Unfortunately, this has backfired. It has made teachers look weak. The public has taken it to mean that the corporate CEOs and venture philanthropists know better than the teachers. And while those CEO partnerships with the unions cover everything from Teach for America, charter schools, Value Added Measurement, and Common Core State Standards the venture philanthropists really want a for-profit system and complete control of our schools and children. Ultimately, my guess is they want every child in the country sitting online at home or at a Rocketship charter. That will make money for some and it will mean the loss of the public’s voice and control of a democratic public school system for all the rest of us. Throughout the years this message of teacher hate has permeated through every community doing great harm. Qualified teachers, who excelled at their craft, have left the field. Young people who would have made wonderful career teachers have gone into other fields or are without jobs. Teach for America (TFA), a group that produces rookie teachers without much preparation, creates a turnaround system of low-cost teachers that looks more like a Peace Corp venture for a 3rd world country than a strong participatory democracy. More recently, TFA have taken real teacher jobs after schools are shuttered and made into charter schools. This is a cheap solution to the real education needs we have in this country. The war against teachers and public schools isn’t, like what you always are told, a war for the hearts and minds of the children. It is war about money. Who will profit and how will they save on teachers in order to make out big at the top. I have faith, that sooner or later, people are going to tire of this and want to return to the good ole days of public schooling, only better. We already see this happening with the pushback on testing, Common Core State Standards, with teachers fighting for their jobs, and parents of students with disabilities who want something better, not less. Hopefully, soon, our teachers’ unions will hand back corporate tainted money and speak out stronger for the teaching profession that American students need. They will not partner with such individuals unless they are actual participants in the conversation. And we will push corporations out of the classroom, where they know nothing about children and their development. It really is true that all other professions spring from the teaching profession. Americans should be worried that the loss of real teachers will create a weak society and students who truly are unprepared. Instead of vilifying, isn’t it time we start valuing America’s teachers? Shouldn’t we be about showing teachers support for the difficult jobs that they do? But in the meantime, speaking of money, all you teachers out there, for those who could afford them, I’d immediately cancel my subscriptions to TIME for Kids and TIME Magazine. Also ask for a refund. There is no need to support publishers who think you fail when you buy their product and use it to instruct children. I’d say it is probably biased news anyway. I think there is a lot of frustration with the educational system in general. We’ve certainly had our share of negative experiences and our frustration with the negative experiences may be amplified by the positive experiences when we’ve seen a teacher doing the job really well. We have a district that refuses to accelerate unless a student knows 90% of the math they would be skipping. A grade skip is unheard of. So bright kids spend the year reviewing material that they already know 75%+. We’ve had a principal most parents hated and district policies that allowed her to remain even though the superintendent wanted her out. We had a teacher at our school that five successive years of parents tried to get out because she was abysmal. They finally succeeded, but she was simply transferred to another school in the district. We’ve had a district that wanted our child who is accelerated in math to start the day at the middle school at 7:30 AM and end at elementary at 4:00 PM, a very long day for a 10 year old. We’ve had teachers that don’t want to provide F&P reading levels or other assessment information until pressed. These are only some of the challenges we’ve had. It’s almost been made worse by our positive experiences because we see what could be. We had a teacher volunteer to teach our 10 year old so she didn’t have to go to the middle school. It’s been rough for students and teacher, but shows a great commitment to helping EVERY child succeed. We have a teacher providing our kindergartner with second grade level books and reading differentiation. We haven’t had that in the past. We had a media specialist volunteer to work with the high ability students, even though it meant giving up some of her prep time. We’ve had some teachers really help out in other ways, provide so much information, and want to really partner with us to make sure our kids get an appropriate education. We’ve had teachers who have made it a point to get to know more about our children’s unique needs and meet them. And it frustrates me because I know the teachers who are going out of their way to help aren’t receiving anything more than the teachers who can’t be bothered. And if they happen to be lower in tenure, the good ones could have been laid off before the bad or mediocre ones. It frustrates me because I’ve seen how awesome educators can be – and how difficult others can be. But what is really frustrating is the feeling of being trapped. We have no choices. We hope and pray for a good teacher. We can’t afford private schools that many of our friends send their children to and rave about. We don’t have any way of changing district policy other than begging. There is a business statement that applies to Twitter, Facebook, Google, and others. “If you are not paying for it, you’re not the customer; you’re the product being sold.” In today’s public education, we feel more like the product being sold than the customer with choices about quality and personal taste. You have very legitimate, specific complaints and I’m guessing they surround not having much of a program for gifted students. These students have never been served well, nor is there much going on for them now in most places. In the last 30 years services and programs in public schools have also seen cuts. My guess is you know all this. I can’t defend the teachers who you criticize. I have known teachers who I didn’t like much too. But these are rough times for public schools and teachers. I’m assuming you have spoken about your concerns with these folks. Maybe they are tired or just don’t care. Either way, thank you for also sharing some good things being done. Too often those things are forgotten. But you are right about parents feeling like their kids are a product these days! Very well written diary of how a parent feels. It isn’t right. It needs to improve. See my comment below for by general perspective. Your comment is an example of this in many ways. Heavy on the adjectives but light on the facts when it comes to your criticisms. Nancy might not defend those teachers. I won’t say I’m supporting them either but that doesn’t mean there is anything validating your accusations. Who says this teacher was abysmal as you describe? What was so bad that this person deserved to be fired? The teacher I describe in my comments below was disliked by many too. Why? Because that was his reputation. Students aren’t necessarily known for their independent thought. They tend to agree with their peers most of the time. I know I did. Luckily, I grew up and learned to think independently (which doesn’t mean peers are always wrong either so don’t put words in my mouth). If a teacher is only given a limited amount of time off for maternity leave, what is it you expect her to do? She should quit her job because its for the children? What’s to say her replacement would have been better? People have to go on maternity leave in teaching like in any other profession. People live through much more difficult things than that. I think there are many difficulties advanced students have in the public school system. This is due to the focus upon remediation of low performers. The reasons for this would require a lot of time to get into but much of it is due to the marriage of political correctness and financial exploitation of the school system. But the people that allow that to happen are politicians and administrators who create standards and regulations; not the teachers who have to follow them. Teachers are often the last barrier between these people and students. My perspective above on who is a good or bad teacher has nothing to do with personality or likability by students. One of my child’s favorites was one of the worst for differentiation, even though that was district policy. The one whom parents attempted for years to get fired was simply because her students were not academically prepared for the next grade. I very much agree that some of the toughest – and sometimes most hated – are the best teachers and I’ve blogged about several that I had that were like that. 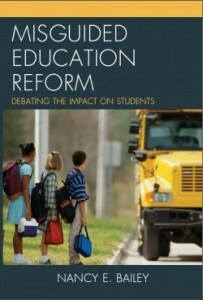 I recognize the political correctness and laws such as NCLB that require the focus on struggling students. Some districts have programs to address the needs of high ability students too. Ours does not; not even a pyramid of intervention for them. We have ‘differentiation’, the oft ‘implemented’ and rarely successful methodology. Some teachers have chosen to not differentiate for high ability students. In my opinion, this is unacceptable, both because it is unfair to those students and because it is against their employment expectations. As I’ve said, we have had others that differentiated well and a couple that have gone beyond and made us happily surprised. I knew maternity leave would be a touchy subject. The core to my beliefs about education is that schools are created to teach students and not to employ teachers. Teachers are vital to this mission and should be accorded respect, good wages, and other things due employees. But they are not the mission and when there is a conflict in interests, the students’ needs must come first. Disrupting student learning for a year is not acceptable, so alternatives need to be looked at. Perhaps it is a time to pursue additional professional development or work in a non-instructive role. The problem doesn’t arise from pregnancy or maternity leave, but from the disruptive transitions and policies that can allow a long-term substitute to not have the same qualifications. We are all parents and have experienced maternity or paternity. We are supportive of this time, but we also want to minimize disruption to learning. I don’t fault the teacher. I fault the system. We can’t afford trade-offs that take the equivalent of two months of learning away from 25 students. I realize many of my complaints are very specific. Other parents will have a different list of issues, but I’ve heard similar from parents of kids with ADHD, special needs, emotional issues, etc. There are going to be teachers who aren’t cutting it, just like employees in any profession. But there are some vital differences. First, if I get consistently bad service at one company, I usually can go to another representative or company. I can’t do that at a public school and there is a huge financial penalty to switch to private. Second, the job of a teacher is really important. We are entrusting our children to you. We care much more about teacher quality than the quality of pretty much any other worker we interact with. What it boils down to we can either say having the right teacher is important for students or not. If we say it is, we need policies to ensure the right teachers are hired and retained and the wrong teachers go elsewhere. Tenure, difficulty in firing teachers, and standardized pay all send the message that teachers are 100% interchangeable. I don’t believe that and I don’t think you do either. But if contracts are written to treat teachers like factory workers, that is going to affect public perception. And assessments will be given that are more appropriate of a factory worker than a knowledge worker. We’ve all seen the studies that a great teacher can provide 1 1/2 years of learning in one year and a lousy teacher might only provide a 1/2 year of learning. Respect for teachers also requires respect for parents. When a parent asks about about teachers and are told “All our teacher are excellent!”, that response damages a parent’s trust in teachers. When ‘partnership’ means just homework enforcer, the relationship between parent and teacher won’t engender respect. We are in for the same thing – the education of our children – or we should be. It’s when we feel that duty is abrogated that things become difficult between parent and teacher. I know that many will disagree with what I have to say. I’m trying to share my perspective so that things can get better, not to create a bigger gulf. You make some interesting points, DR. But I have to say we must all agree that teachers have been treated terribly in recent years. Surely you haven’t bought into the “business can do it better” mantra on the front of TIME! It might be wise to make sure a teacher is a good teacher before they receive tenure. But teachers can still be fired with tenure, the point is they get due process. They get a fair trial before being fired. As far as pregnancy leave I think we can agree that the administration should have a real teacher in place for a lengthy absence. By the way, education now has many in leadership positions who have no experience working with children, nor have they studied things like differentiation. Let’s agree that programs for gifted children are still needed in most places, and a well-educated teaching profession should be high on the list of critical priorities for gifted and all children. Thanks! Nancy, do you see this disrespect, poor treatment, and hate directed at all teachers or just public school teachers? I have to agree with Gabriel Ross. Faulting a teacher for taking maternity leave is not appropriate. Teachers — like anyone — should not be expected to put their students above their own families. The sub may not have been any good, but it isn’t within the teacher’s realm of influence to choose the sub. Everyone will most likely encounter a teacher he or she doesn’t like. The typical student will have at least 30 (bare minimum) teachers in his or her life. (Most of us have quite a few more than that. Some of us have a lot more than that.) It is inevitable that we will not get along with all of them. Children are usually unable to recognize the distinction between differences in personality and style versus skill and ability. They haven’t yet learned to distinguish between facts and opinions or style and substance. Hopefully, by the time we reach adulthood we understand these distinctions. But our formative years are so dominated by the teacher student relationship that those feelings are difficult to separate from facts. I think people can easily distinguish between personality and skill in other licensed professions such as law, medicine, accounting etc… But this issue of teaching eludes many because there is so much emotion tied into it. So most teachers now have someone who doesn’t like them. And whenever someone (student, parent, administrator) doesn’t like a teacher, that teacher is a ‘bad’ teacher. And the only logical reason such a bad teacher could continue to work would be that all the other bad teachers are protecting them. This is nonsense logic. Rarely is ‘bad’ defined in any meaningful way that shows bad practice. In fact the so called ‘grossly incompetent’ teachers of the Vergara case included a Teacher of the Year. I’m sure she go that award as part of a sneaky teacher conspiracy to protect the bad teachers. But it just goes to show that when you don’t discuss quality in meaningful ways, anyone’s opinion can be used as grounds for judgement. And everyone’s entitled to his or her opinion. But everyone’s opinion isn’t grounds for hiring and firing. Those decisions should be made for more important reasons grounded in facts especially when dealing with such an important issue as education. Of course there’s much more to it than this. But if I had to sum it up I would say that I once hated a teacher who failed me when I was 17 and I was sure he was a bad teacher. By the time I was 27 I understood why and appreciated it and him. I would like to think that most people have this wisdom. But I’m not so sure. Gabriel, Thank you so much for such a wonderful description of the teacher/student relationship. Many fine points here and also about gifted education. Well I am one of those teachers who had a reputation of being “scary” and “hard” and to some “bad”. Almost all of my students started out nervous and worried and most of them ended the year exclaiming that they had learned a lot and that I was just tough and old-fashioned in that I expected them to work and learn. I was always there at lunch, after school, to give extra help and even though the course was math and so many students came in not liking it or thinking they weren’t good at it, I refused to validate that thinking. There were a few parents who enabled their kids. I began teaching in 1974 and just retired 2 years ago and have lived through exactly what you describe. It was harder and harder to teach content and ideas rather than to the test. And when at my 35th year I encountered an administrator who wanted test scores above all else I decided to leave public education. I miss the excitement of kids understanding a concept like algebra and seeing the real world application of it but especially the “No Child Left Behind” years reduced my days to basic skill drills, practice tests and more skills. Gone were the projects that were challenging, innovative and interesting where kids were given a question like “If this is an arrangement of fences that can hold one cow, and this arrangement can hold 2 cows, how can you determine what the arrangement would be for 100 cows?” And then as a teacher you help them make a hypothesis, create a working experiment to work out the patterns and find the answer. As a class you come together, share each other’s ideas, evaluate and generalize and use what you learned on the next more complicated section. Today there isn’t much of this in depth discovery in textbooks. You have page after page of skills. I know I’ve gone on a rant but I am passionate about kids learning math and passionate that they will love it too. It sounds like you reached a lot of students as a teacher, Joy. I think tough teachers are good teachers as long as they are fair. It sounds like you were both. Thank you, for your great comment! In response to DR from above, yes I do think public school teachers are vilified. TIME”s article is a good example of that. If you are a veteran teacher you are especially criticized because you receive a higher salary on the step plan. However, it has been common knowledge for years that private school teachers are usually paid less than public school teachers most likely due to lacking union representation. But private school teachers sometimes get to work in better facilities. And they may generate more respect due to parents who believe in what they are paying for. That is why I’m saying that the frustration (and hate) is really at the public educational system and not at teachers. And it is probably more an issue with bad administration at certain public schools than a nationwide issue. The examples I gave that were negative were almost all at one public elementary. After three years, we were so fed up there that we switched to a different public elementary in the same district. The positive examples are almost all from that new elementary. It was a sacrifice for us. We have no busing and our kids aren’t at the the same school as others in our neighborhood. The primary difference, I believe, is the expectations at each school for the teachers, set by the principal and other teachers. The first school set out to educate. The second set out to partner with parents and educate. At the second school, we get so much information on what our kids are doing; the teachers invite parents to help out in the classrooms in meaningful ways, not just stuffing folders; letting parents know to please contact them with any issue and not wait until conferences; thanking parents for feedback instead of being defensive; trying to provide differentiation and letting parents know about it even if they aren’t always successful; taking the initiative to address issues instead of waiting for parents to complain; and being honest with parents about which teacher is right for their child and why. The whole school feels different. The principal and other teachers simply won’t allow bad parent-teacher relationships to go unresolved. They also won’t tolerate a mediocre teacher remaining at the school and value parent feedback on who the great and not-so-great teachers are. I don’t think businesses will do a better job at running education, but I think education can learn from schools that are run using business principles. Private and parochial schools have to provide enough of a value that people are willing to pay significantly extra to send their children there. They can’t tolerate bad teacher-parent relationships or a group of students not having their needs addressed. They can’t take a monopolistic position because that will shut them down. I attended public and parochial schools growing up. When I needed acceleration in math at the parochial school, my dad went and talked to the teacher and the principal and I found myself in higher math classes almost immediately. When several of us were ahead in English, the teacher had the ability to give us above grade level work without any testing. When my kids are ahead in math, we had to jump through hoops and beg to get accommodation. When I blogged about how to game the system and get kids accelerated in math by teaching children over the summer, the district moved the tests up to before the summer began. When we ask for acceleration in English, the schools won’t provide reading groups at their levels. If people “hate” public school teachers, but like private school teachers, let’s have an honest and difficult look at the differences. No more easy political solutions. No more broad brushes. Look at if it is the system and which aspects of the system. Is it one-size-fits-all vs. personalization? Is it policy differences? Is it aspects of unionization? It it parent-teacher dynamics? Are the teachers attracted to public vs. private different? I think public school teachers also need to change the narrative. Any time someone complains, even justly, that they aren’t respected or they are disliked, herd mentality says that the listener will start agreeing and dislike and disrespect that person or group more. Change the narrative! If teachers start talking about how much they are respected and liked, respect and like for teachers will increase. Some people say they are for public education. I am for EDUCATION. 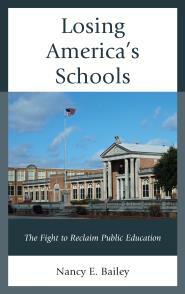 Get students needs addressed whether it is through traditional public, charter, private, parochial, home, or unschooling. All of these could stand to learn something from each other. If there is an issue in one, look at how the others solved it. Put kids first and all will do better at education. Hi DR, I almost missed this! It is very interesting. I like what you say about principals. I agree! Schools do work best when principals are engaged with what is happening in the school and are supportive of teaching. And certainly some business principles are helpful to running a school well. I do think though that there is an overall effort to get rid of professional teachers in public schools. You might not see it where you are, but in many places Teach For America and other such groups are being pushed as the best. It is troublesome. But thanks so much for writing so much interesting stuff. Teachers hating teachers. Maybe its new for some of you. Let me tell you my story. As, LA teacher for 7/8 grades, I facilitated a monthly newspaper that was for students and written by students. I never knew how much I was hated until our first copy came out. Many teachers in the school threw them away and “forgot” to give them out. Students would complain that they couldn’t get a copy. I went to my Principals and asked why the teachers were doing this. Their reply “You are the most hated teacher we have ever seen in all of our years in education.” They then sent out a warning email to have the newspapers given out every month, and then I was hated more. I left at the end of the year and never looked back. I volunteer helping the homeless in our small AZ town and find solace in this. How sad. I am sorry.